Blackhawk jersey cookies are on sale at Central Continental Bakery in suburban Mount Prospect. 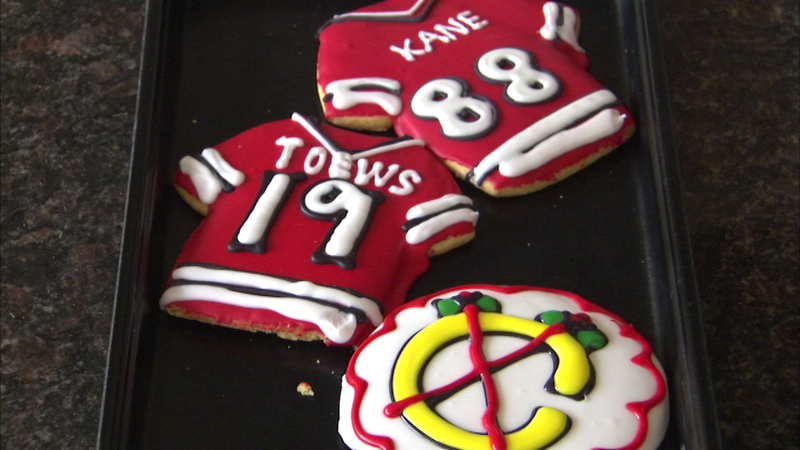 MOUNT PROSPECT, Ill. (WLS) -- A suburban bakery is indulging Blackhawks fans with a sweet tooth. The Central Continental Bakery in Mount Prospect is churning out 1,200 cookies a day that are decorated with Blackhawks jerseys. Cookies are selling as fast as they are coming out of the oven. In fact, fans across the country are calling for the cookies but the bakery can't ship them because there's such high demand at the store, said Linda Spinelli, bakery manager. "Everyone likes to root for your home team it just brings everybody together," Spinelli said. The cookies sell for $4.25 each. The Blackhawks play Game 2 of the Stanley Cup Finals on Saturday.